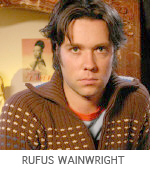 In this week's podcast, we chat with Rufus Wainwright about his current project, an ambitious two-night stint at Carnegie Hall next week re-creating Judy Garland's legendary 1961 live concert there -- he'll sing all the same songs with the backing of a 40-piece orchestra, staging by Sam Mendes and an outfit courtesy of Viktor & Rolf. Despite the dauntingly iconic stature of both Garland -- he's a self-professed "total Judy Garland fanatic" -- and that particular show, Wainwright says it's a nice break from doing his personal material. "The only thing I'm really worried about is my own body. I've never really done a whole show just standing up with a mic," he says. "So I don't know, you may see some kicklines." To subscribe to the podcast, add Conversations to your iTunes subscription list (it's free) by clicking here.